Did you know that almost 200 workers were killed at work in 2015? These deaths have caused immense grief to the families and friends of the deceased workers. 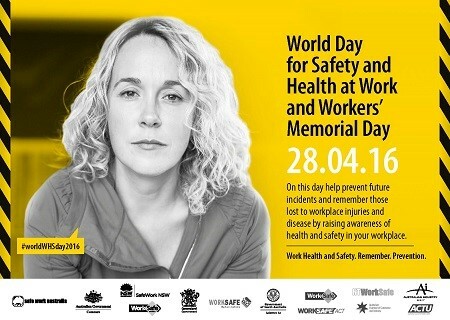 Thursday April 28th is World Day for Safety & Health at Work & Workers Memorial Day. This day is to remember those who have died due to workplace incidents & disease and to raise awareness of work health and safety. It also reminds us to think about how we can prevent future incidents or deaths in the workplace.